Understanding lending terms is critical to developing a good financial plan for your business. That business plan, in turn, can impact your financing options. Thus, everything is tied together. Being educated on all fronts will help you achieve greater success in the commercial real estate business. 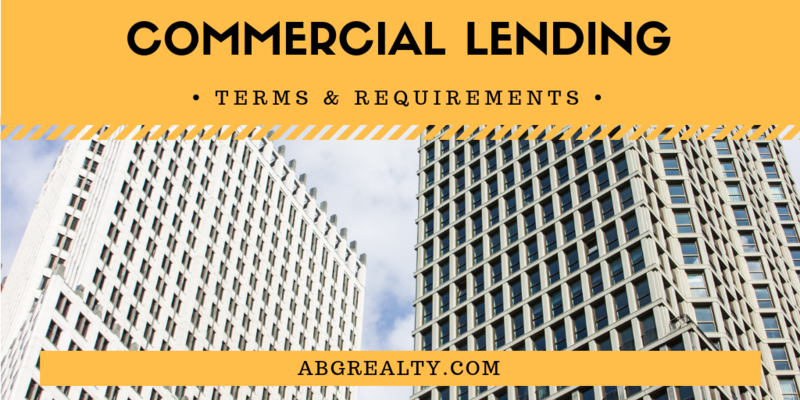 Below is an overview of common commercial real estate lending terms and requirements. Commercial loan lengths generally run between 5 and 20 years for a repayment period. Some offer 30-year amortization but require repayment much sooner. For instance, you may have a 15-year loan with payments amortized over 30 years. This leads to a smaller monthly payment, but after 15 years, a large balloon payment is required for the remaining balance. When evaluating loan periods, consider whether lower monthly payments are beneficial given the large payment at the end. Would this fit your business plan better than a higher but consistent monthly payment without a balloon? Commercial real estate loans often cover 60% to 80% of the loan-to-value. Having a low loan-to-value can result in better interest rates and other terms as your loan will be less risky to lenders. Many real estate investors look to private funding through their network to cover the gap in funding. Keep in mind that this may impact the terms of your primary loan. Lenders prefer that you use your own funds towards your purchase. Commercial lenders will evaluate a borrower’s ability to cover loan payments with their annual net income. This is referred to as the debt-service ratio. This figured is calculated by dividing the annual net operating income by the annual commercial loan payment debt. A figure of 1, for instance, would indicate that the two figures are even. A figure of 4 would indicate that income covers 4 times the amount of debt. Thus, the higher the number, the better. Most commercial loan terms ensure that lenders will receive a certain minimum amount of interest. This can be accomplished through terms such as lockout periods, which prevent a payoff from occurring too soon. Pre-payment penalties may also apply. Be sure to pay close attention to these terms and compare it to your business plans. One of the most important commercial real estate lending terms are recourse and non-recourse. If you are purchasing a commercial property under a business entity (such as an LLC), recourse loans require a personal guarantee from the owners of that business. This is in addition to the collateral of the property itself. Thus, if the sale of a property is not sufficient to pay off the commercial loan debt, lenders have the capability to go after the guarantors/borrowers for the shortage. Commercial loans are usually recourse loans. Although we have listed some common commercial real estate lending terms above, it is important to note that these types of loans can vary greatly. Factors like the type of property, intended property use, business plan, predicted financials, and type of bank can play a major role in the specific terms offered by commercial lenders. Refer to our blog post on commercial real estate loan tips for additional helpful information on the application process.